Positive displacement blowers or PD blowers have been traditionally used by manufacturers for bulk handling of cereals and grains, metals and minerals, and cement and sand. Invented over a hundred years ago, PD blowers have not evolved a lot. 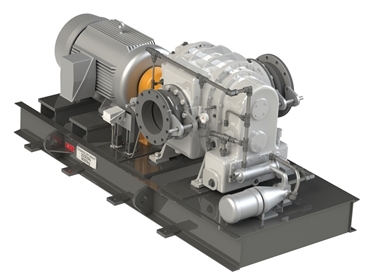 However, companies seeking to improve the efficiency of these blowers to meet the demands of the 21st century can follow a few tips to save energy and increase reliability. Keeping a backup bare-shaft blower on the shelf can mitigate risk of extended downtime and allow sufficient time for regular blower maintenance to be conducted. One could also use two blowers instead of one, splitting the duty to increase reliability. Check the age of the blower and make a call on whether replacing the motor to a more efficient one would make a difference. Also, find out when it was overhauled last - bringing the blower back to customer specifications can lower energy consumption. Investing in variable speed driven control options can result in significant energy savings in variable flow applications. If the blower is operating on a fixed speed, heavy duty cycle, significant excess energy is being consumed during low flow periods. Correct sizing of the blower is an important factor, when it comes to power consumption and performance. A correctly sized blower may be cheaper than the one bought 10 years ago, and it will also be more economical to run. Observe the blower’s maintenance costs. An aging blower with high maintenance costs can be constantly causing downtime and wasting precious energy. The maintenance and operational costs may even exceed the cost of a new unit. Will the blower last at least 20 years? How easy is the maintenance, and how often does it have to be checked and serviced? Would the model range be large enough to select a unit that fits the desired duty? Is the blower robust and fit for harsh Australian climate conditions? GE Roots blowers, supplied by Hurll Nu-Way come with an industry leading 24-month warranty period, and are available in both bare shaft models to retrofit on an existing base as well as complete blower packages designed to suit any bulk handling application. Vacuum, pressure and high pressure blowers are available.